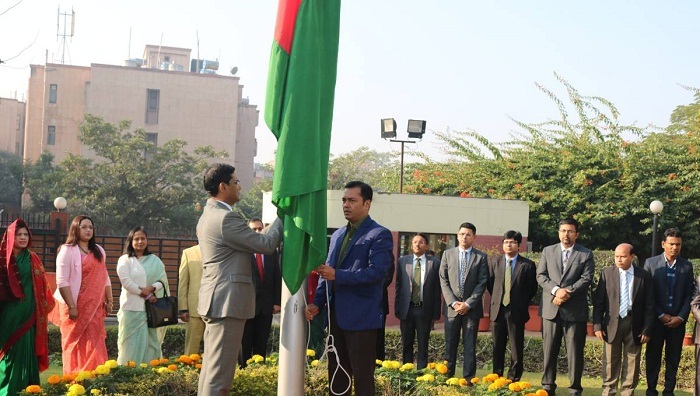 The Bangladesh High Commission in India celebrated the 48th Victory Day on Sunday, paying homage to Liberation War martyrs and the nation’s founding father Bangabandhu Sheikh Mujibur Rahman. The mission gratefully recalled the support India had extended during Bangladesh’s struggle for freedom and the supreme sacrifices made by Indian soldiers who fought alongside the freedom fighters. Bangladesh was born as an independent country on this day in 1971 after the Pakistani occupation forces surrendered after a nine-month bloody war. The new nation emerged through the sacrifice of three million freedom-loving Bangalees and the honour of 200,000 women. Sunday’s programmes featured hoisting of national flag by Deputy High Commissioner ATM Rokebul Haque, playing of national anthem, reading out Victory Day messages from President Md Abdul Hamid, Prime Minister Sheikh Hasina, Foreign Minister AH Mahmood Ali and State Minister for Foreign Affairs Md Shahriar Alam. Bangladesh High Commissioner to India Syed Muazzem Ali attended the Victory Day programme in Kolkata. A special prayer was offered for the martyrs of the 1971 War of Independence. The people also prayed for Bangabandhu and his family members who were killed on August 15, 1975. The High Commission said the New Delhi mission would organise a cultural evening marking the Victory Day on Monday.